Caricatures of the greatest guitars ever ! Announcement NEW!!!!!! Downloadable 16x23" posters available! More coming soon!!! NEW!!!!!! Downloadable 16x23" posters available! More coming soon!!! Good quality and nice artwork! 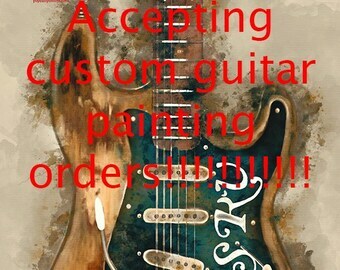 Painting digital caricatures of the greates guitars of music history. I'm drawing and painting since I was around 3 years old, because I always felt it easy and entertaining. I'm a massive guitar, music and movie fan, so I tried to cross my hobbies, and pay tribute to the movies and music I love. Playing guitar, drawing, listening to music and watching movies are those things that makes it possible to me to live and not just survive. I Don't have the equipments to apply my designs on mobile phone cases and mugs.